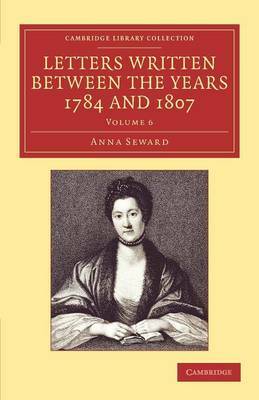 The literary career of Anna Seward (1742-1809) had many frustrations. Erasmus Darwin once printed her poetry under his own name. Horace Walpole accused her of having 'no imagination'. And despite her evident talents, she was unable to find a patron willing to support a woman. Yet her letters reveal the breadth of her interests and the strength of her literary criticism. In addition to writing to newspapers and magazines, she counted many eminent figures among her correspondents, including James Boswell (who begged for a lock of her hair) and the young Walter Scott. This six-volume selection of her letters, edited by the publisher Archibald Constable (1774-1827), first appeared in 1811. A touching record of her final years, Volume 6 covers the period 1802-7. It includes her letters to the young Walter Scott, who visited her at her Lichfield home and prepared an edition of her poems after her death.